On June 4th, 2018, The Daily Wireissued an assault on Corey Stewart, the presumed frontrunner for the GOP Nomination for US Senate in Virginia, claiming him to be an admirer of white nationalist Paul Nehlen. The article bases its claim off of a February 2017 video in which Stewart calls Nehlen a hero for standing up to Paul Ryan in the 2016 election. Kassy Dillon, the writer of this article, fails to realize that Nehlen’s horrific views on race were not known to the public at the time. In fact, Paul Nehlen was a relatively unknown figure until he received national attention for his attacks against Jews in mid-2017, months after Stewart had praised him. 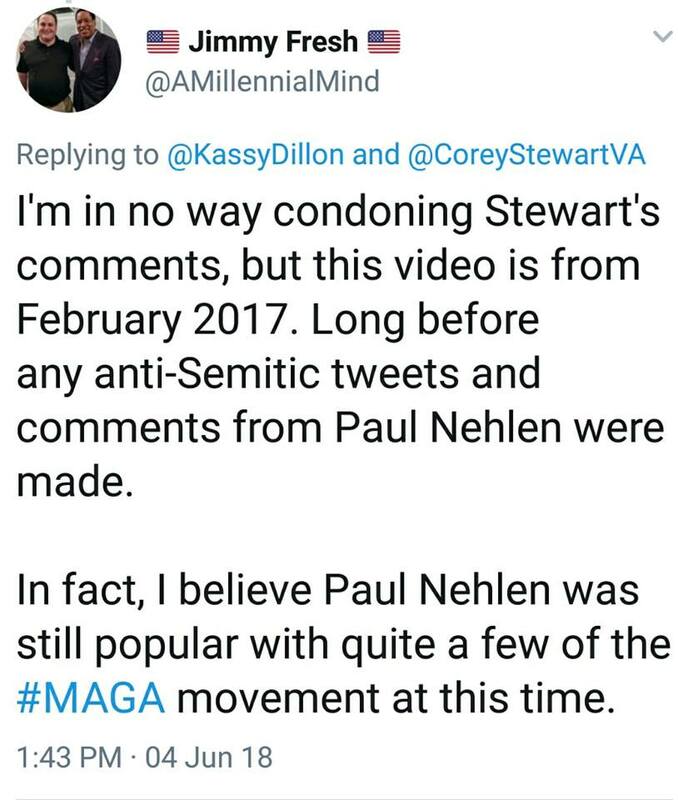 Paul Nehlen exposed himself as a racist ethno-statist well after Stewart had spoken kindly of him, but that doesn’t stop the “conservative” thought police from attacking Corey Stewart for praising a man who had previously just been known for standing up to establishment figures like Paul Ryan, not for the horrific views which he kept private at the time. That didn’t stop this lie from being spread around by many prominent conservatives who urged Corey Stewart to step down. 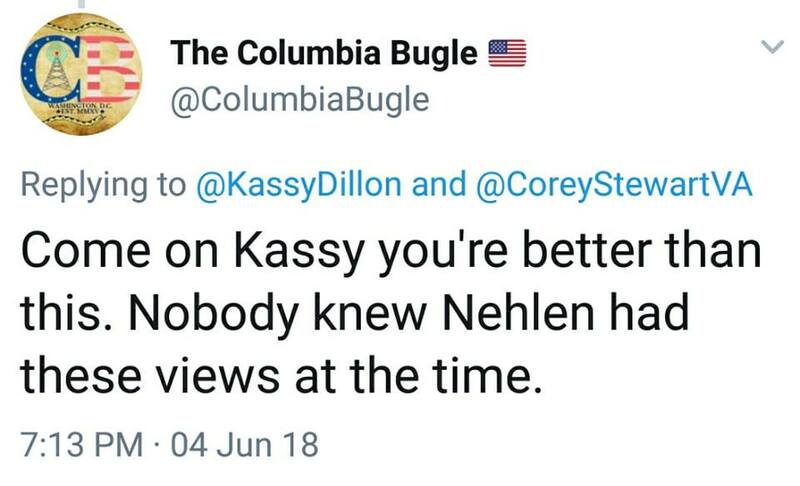 Thankfully, other conservatives spotted out the inconsistency of Kassy’s article and immediately pointed out that Corey made these comments long before Paul Nehlen came out as an anti-Semite. Kassy ignored these responses. This is certainly not the first time The Daily Wire staff needlessly and falsely labeled someone as alt-right. Ben Shapiro, Dillon’s boss called Ron Paul alt-right, last August. This has led to fake news journalists with a reputation for defamation, such as Caleb Ecarma, picking up on the story to further harm GOP candidates in national elections. In truth, this thought police mentality that Ben Shapiro has fostered among the Right has led to a loss of grounds that will only help the Left win. If we want to be taken seriously, we must have honesty in journalism. Editor’s Note: Liberty Hangout does not endorse Corey Stewart for the 2018 GOP Nomination for US Senate in Virginia. In fact, we proudly stand with Nick Freitas, who will serve as a fantastic ally to Rand Paul in the senate. The mere purpose of this article is to correct the blatant lies of the article that tries to tie Corey Stewart to the Alt-Right in a manner that is similar to the witchhunts at Salem, and should not be misconstrued as an endorsement of Stewart, Nehlen, or any other individual.